What’s The Best Brand of Soccer Cleats After 2015? If you’re searching online where to buy cheap soccer shoes, you’re not alone as a lot of people are, and the good news is the major brands have responded by bringing down their price and making their products more affordable. That’s great for buyers, but how do you decide which of these brands to buy from? What you need to do is compare these brands and decide which one offers the features that you’re looking for. There are literally hundreds if not thousands of shoe cleat brands on the web, but you can make things easier by limiting your comparison to the top brands today. There’s a reason why some brands have become more popular than others, and it is all about reliability and affordability. Soccer is an intense game and it’s imperative that your pair of cleats deliver in terms of performance and comfort. The top brands have their names by providing these, so start your comparison with them. This guide offers a review of the top 5 brands and you can use this as a guide to help you make the right decision. Comfort and an affordable price tag are two of the primary considerations, but you also need to consider the type of pitch you’re going to play and if the cleats meet your requirements and your budget. If you don’t know how to get started, just use the following as a guide for the top cleat options. 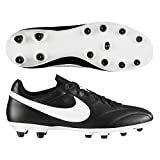 Nike Premier Soccer Cleat – One of the best new soccer cleats today, the Premier comes with kangaroo leather upper for comfort and an anatomical sockliner for low profile cushioning and support. The high quality goat leather provides cover for your entire foot and offers more than sufficient softness for your feet. The Premier ha the classic look of cleats but it also makes use of the latest technologies to provide comfort and stability. The anatomical X1 provides this cleat with a fast, slim shape over the sockliner, and the sockliner support is deeper compared to those of other soccer cleats. Adidas Performance Men’s Copa Mundial Soccer Shoe – The Copa Mundial has high quality rubber sole and top of the line kangaroo leather upper. In addition the Copa Mundial has dual-density outsole that provides maximum comfort when you’re playing on the pitch. The insole has EVA so when you play it is going to feel soft and comfortable. These cleats have direct-injected, firm ground and durable outsoles to ensure balance. In addition the Copa Mundial has been designed for use by serious soccer players and apart from comfort and style, these cleats also provide sufficient control, something that’s essential when you’re playing. PUMA Men’s Evospeed 4.3 Firm-Ground Soccer Shoe – The Evospeed 4.3 is equipped with several features so your feet remain comfortable and looking stylish while playing. This includes the synthetic sole, the Puma callout and the Formstrip at the lateral side. The SpeedCELL designation and EvoSPEED callout are present here, and combined you’ll feel the difference in terms of the lightness and responsiveness. Another notable aspect of this cleat is the heel insert as it manages to be soft and durable at the same time. Typical of other Puma shoes it’s minimalistic yet practical and finally these cleats don’t require any break-in. ASICS Men’s DS Light Wide Soccer Shoe – The DS Light is best known for its synthetic sole and the removable insole, but there’s a lot more to this than that. With the DS Light you achieve the right combination of balance, quickness and stability necessary to play competitive soccer. The kangaroo leather upper is also a welcome feature as it leads to superior touch on the ball. The cleats also have a special mesh tongue that reduces its weight while providing extra breathability. The cleats also make use of 3 D arch fit technology that makes it a more convenient fit and easier to take off. Diadora Soccer Men’s Brasil Classic MD PU Soccer Cleat – The Brasil Classic has many of the features you’d expect such as quality syndetic sole and soft kangaroo leather, but in addition you also get multi-density outsole and soft cushioned insole for extra comfort and protection as you play. Unlike those on cheaply made cleats, the leather on the Brasil Classic is water resistant and there’s EVA foam for extra cushioning. These cleats are also comfortable to wear and the break-in period is much quicker compared to that of other cleats. Even if you wear these for a long time your feet will still feel comfortable. The reviews above show there are different types of cleats to choose from including those for hard ground, firm ground or molded outsole, replaceable, turf, indoor and others. There’s no need to get confused however because the product description will state which pitch the cleat is designed for. There are other things you have to consider: with soft materials you’re going to get the best as far as touch goes, but make certain that it’s made of high quality materials and that it is durable. If you are going to play on soft grounds, the cleats have to be designed for that purpose otherwise the water and / or cold will seep in and make playing very uncomfortable. You also need to look at the treatment and coating used for the uppers as this has a major effect on the performance of the cleats. The cleat uppers can and do come in different types such as calf skin and kangaroo, with kangaroo one of the most popular now owing to its reliability and durability. When you’re looking for places where to buy cheap soccer shoes, bear in mind that you’re going to get what you pay for. That doesn’t mean you have to spend a lot of money just to get quality cleats, but at the same time you have to do research and be willing to pay for a good pair of shoes.